"Companies need to focus their Export strategy on Growth markets having a plan for the Bric's is vital"
We are the new NCR: Leading how the world connects, interacts and transacts with business. NCR is at the center of the self-service revolution, strategically poised between consumers who demand fast, easy and convenient options, and businesses intent on increasing revenues, building customer loyalty, reaching the contemporary consumer and lowering their cost of operations. Our leadership in customer interactions is built on deep consumer and industry expertise. 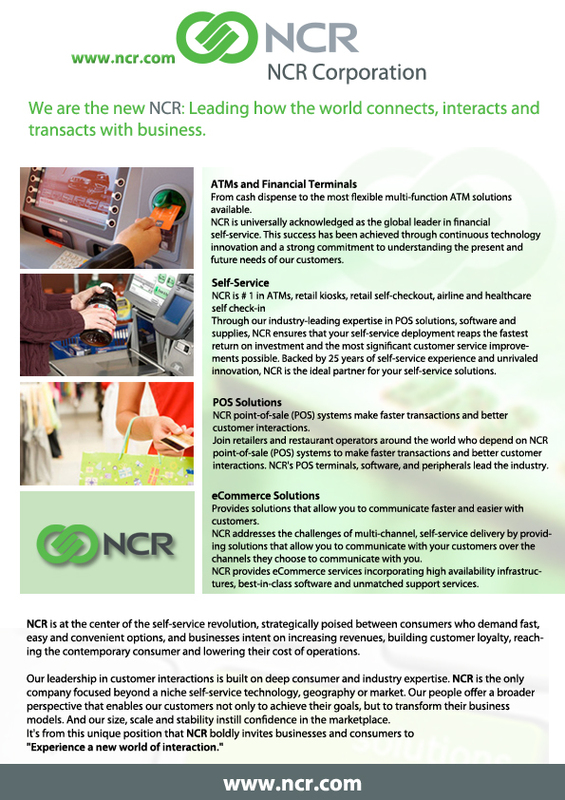 NCR is the only company focused beyond a niche self-service technology, geography or market. Our people offer a broader perspective that enables our customers not only to achieve their goals, but to transform their business models. And our size, scale and stability instill confidence in the marketplace. It's from this unique position that NCR boldly invites businesses and consumers to "Experience a new world of interaction."